Dell launched three new storage solutions designed to help businesses manage the massive growth of data at various price points. The company's new SCv2000 brings the SC series down to a new lower entry price point, the PS6110 offers more capacity and performance thanks to a dense array architecture and the Dell Storage with Microsoft Storage Spaces expands Dell's software-defined solutions. Starting at $14,000 (£9,180, AU$17,560), the Dell SCv2000 comes in at under half the cost of the Dell Compellent SC8000, and offers the same common management and core features as higher end models in the SC series. There are three models in the series. The SCv2000 and SCv2020 fit inside a 2U design supporting either 12 or 24 hard disk drives, respectively, while the SCv2080 comes in a 5U design with support for 84 HDDs. All models come with options such as RAID tiering for capacity optimization, thin provisioning, flash support, data migration services, and multi-protocol connectivity. The SCv2000 comes with "integrated data protection to support specialized projects, database and test environments, or simple storage consolidation," and Dell says that this allows customers to standardize on a single platform to save time and management costs. The SCv2000 can be managed with the same interface as other models in the SC line, providing an easy path to migrate data to the more robust Dell Storage SC4000 or SC8000 series if storage needs grow or change. The Dell Storage SCv2000 Series arrays are available globally today. For higher storage needs, the PS6610 features a dual-controller array, offering 3.5 times the capacity and up to seven times the performance of the previous generation Dell EqualLogic PS6510 arrays. The density has also been increased by up to 2.8 times compared to the prior generation. This allows customers to store more data and access data more quickly, Dell said in a statement. The PS6610 supports up to half a petabyte of capacity in a 5U array in hybrid flash and hard disk drive options. Because of the improved density and performance, these arrays require less space to accommodate business' growing data requirements. 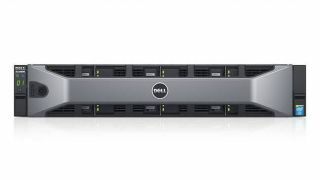 "The PS6610 appeals to organizations seeking advanced storage features in a dense array that is easy to manage and is optimized for workload consolidation, such as ERP applications, email storage and SQL databases, and for archival storage to support large data repositories such as those required for medical records, financial data and video surveillance," Dell said in a statement. The PS6610 ships with the new PS Series Array Software 8.0, which provides support for virtual environments, compression of snapshots and replicas. The software supports VMWare VVol. Dell is making the Array Software 8.0 free to existing customers under contract. The hardware and the software will be available in the third quarter. Dell Storage with Microsoft Storage Spaces comes in five configurations, with capacity ranging between 10TB and one petabyte of storage. Dell says that these solutions provide customers with an "SDS and virtualized storage approach to various workloads, including private cloud deployments, virtual desktop infrastructure (VDI), and SQL and Hyper-V environments." The Dell Storage with Microsoft Storage Spaces solution ships globally in June.